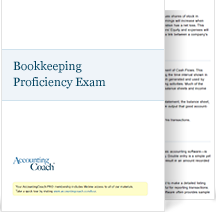 Test your bookkeeping skills online. 1. A listing of the account numbers and titles but without account balances is the ______________ of accounts. 2. Prior to approving a vendor's invoice for payment, the invoice, receiving ticket, and ______________ order should be compared. 3. The report that sorts a company's accounts receivables into current, 1-30 days past due, 31-60 days past due, etc. is referred to as the ______________ of accounts receivable. 4. The amount of insurance premiums that have not yet expired is reported as an ______________. 5. Adjusting entries are recorded in the ______________ journal. and $2,100 of checks outstanding. The adjusted balance per the bank statement is $______________. 7. Which of the following will increase the balance in a liability account? 8. Which of the following will increase the balance in a revenue account? 9. Rent Expense, Wages Expense, and Advertising Expense are expected to have ____________ balances. 10. The cost of the land that is used as the site of a new warehouse should be depreciated. 11. The book value of a company's equipment is usually the same as the equipment's fair market value. 12. Assets that will turn to cash within one year are reported as ___________________ assets. 13. Costs that are used up or expire in the current accounting period are reported on the income statement as ______________. 14. Generally, the amounts reported in the accounts Land, Buildings, and Equipment are the historical ______________ of these assets and not their current market values. 15. The balance sheet reports amounts for a ______________ ___________ time. 16. Normally, the Inventory account will report the goods on hand at the selling prices of the goods. 17. An hourly-paid employee's take home pay is also known as the employee's net pay. 18. Federal income tax withheld from an employee's pay is matched by the employer. 19. The sale of a company's old delivery truck would be recorded in a sales journal and in the account Sales. 20. ______________-entry bookkeeping involves two or more accounts when recording every business transaction. The above bookkeeping questions are taken from AccountingCoach.com's 300-question Bookkeeping Exam. Includes 300 questions and answers.